Dr. Salvay is now using the latest technology to provide his patients with the convenience of cataract surgery without the discomfort, hassle, risk, and cost of eye drops needed for the surgery. Patients will no longer have to purchase costly medications that have to be applied four times daily before and after cataract surgery for up to a month. Dr. Salvay has been doing no-stitch cataract surgery for many years, but with new research data and new medications available, he now uses a technique where the antibiotic and anti-inflammatory medications are placed directly inside the eye at the time of surgery. This development has allowed for faster return to a normal life for his patients, and reduced risks of drop allergy and irritation. Now, almost none of his patients require drops of any form after or before the procedure. Dr. Salvay prefers that his patients have the most up-to-date surgery available. This is why he performs cataract surgery using topical anesthesia. The anesthesiologist will give you some medication to relax you, and Dr. Salvay will give you numbing drops to anesthetize the eye. This way there is no needle injection of anesthesia which could result in a black eye, and other risks. There is also usually less overall risk of anesthesia because the anesthesiologist does not have to give as much medication to sedate with the minimally invasive topical treatment. It also allows you to begin using the eye immediately after you are finished with the cataract surgery. Dr. Salvay uses such a small incision size and attention to detail that the tissue of the eye is able to have a watertight seal without any stitches in over 95% of cases. Dr. Salvay uses two small incisions to perform the cataract surgery-the incision sizes are only 1 mm and 2.4 mm. This allows for faster visual rehabilitation so you can do the activities that you want to do sooner after the procedure. Imagine being able to see without relying on eyeglasses or contact lenses. Now, there are amazing high technology intraocular lenses that make it possible for Dr. Salvay to perform cataract surgery by removing the cloudy lens, and replacing the old lens with a lens that corrects astigmatism or allows you to see both distance and near in a single procedure. This may allow you to break free from eyeglasses or contact lenses. When the surface of a normal eye’s cornea has a spherical curve, like the shape of a basketball, light rays passing through it bend toward its center and focus on one spot. Sometimes, the surface of the cornea is curved more like a football, with both flatter and steeper curves. When the surface of the cornea has an uneven curvature, vision becomes distorted. This common irregularity, called “corneal astigmatism,” causes blurred or distorted vision because light rays are not focused at one spot to provide clear vision. A person who has both a cataract and corneal astigmatism will not regain high-quality distance vision after surgery to remove the cataract unless the astigmatism is also corrected. 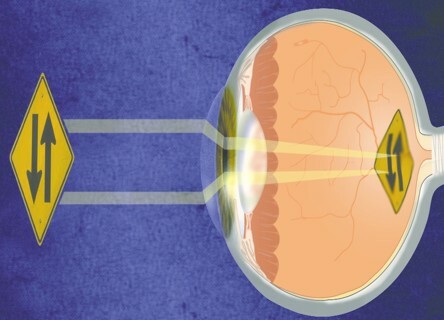 If you are planning to have surgery to remove a cataract, you now have an additional option… an implantable lens that makes it possible to treat the cataract and correct the corneal astigmatism at the same time. Dr. Salvay will recommend the option that is best for you. What exactly is a Toric IOL? Surgery to treat cataracts is an outpatient procedure where an eye surgeon removes the clouded natural lens and replaces it with an artificial lens. Traditionally, the surgeon implants a monofocal artificial lens, commonly called an “intraocular lens” (IOL). If you have astigmatism, however, you may still experience blurred and distorted vision because a standard IOL cannot correct corneal astigmatism. To achieve quality distance vision with a standard IOL, you may still require eyeglasses, contact lenses, or further surgery. If freedom from eyeglasses for distance vision is important to you, you now have a better option. 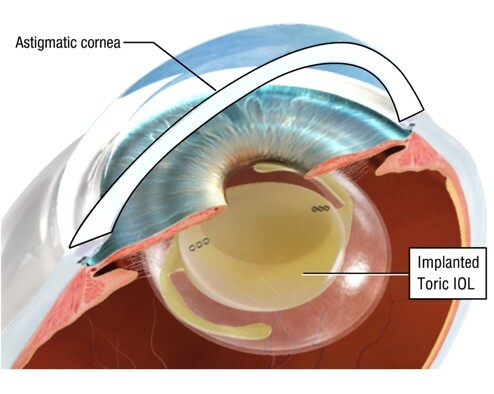 The unique design of the Toric lens provides significantly improved distance vision and may reduce the need for corrective lenses. As we perform daily activities such as reading, watching television or working at the computer, our eyes are constantly focusing on objects at varying distances – up close, far away and in-between. The ability to quickly change focus throughout our range of vision is called accommodation. Accommodation: The ability of the eye’s natural lens to change shape to focus on objects at various distances. Unfortunately, we begin to lose this ability as we grow older, gradually becoming more and more dependent on bifocals or reading glasses. Presbyopia is a gradual loss of flexibility in your eye’s lens and surrounding muscle fibers that makes it harder for the eye to focus up close. It’s why many people develop the need for reading glasses. Presbyopic Multifocal Lenses (Tecnis Multifocal, AcrySof Restor): A better option for quality vision at distance, near and anywhere in between. Until recently, life without reading glasses or bifocals was not an option for cataract patients because traditional monofocal intraocular lenses could only improve distance vision. 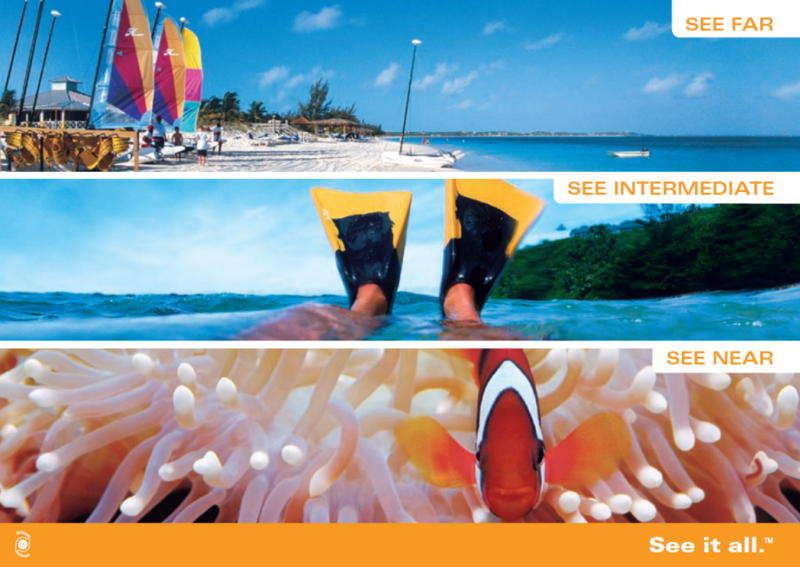 The multifocal lens, on the other hand, allows you to see near, far, and in between. Most patients find they can read a book, work on the computer, and drive a car-day or night-with an increased freedom from glasses. You’ll notice that, on the multifocal intraocular lens, the center of the lens surface consists of a series of tiny rings, creating a smooth transition of light between distant, intermediate and near visual targets. In fact, 4 out of 5 patients in the clinical study who had the AcrySof ReSTOR lens in both eyes reported never having to wear glasses for any task, and in another study 85% of patients never had to wear glasses with the Tecnis +4.0 Multifocal lens. In another study with the Tecnis Multifocal +2.75 lens 98% of patients could function at intermediate and far distances without glasses. Since there are multifocal lenses of different powers, Dr. Aaker will speak with you to choose the lens that works best for your vision. A multifocal lens will help you have reading, intermediate, and distance vision. Different activities are usually performed with the various depths of vision. Near vision is used to read books, and medication bottles; intermediate vision is used for computer screens, cell phones and car dashboards; while distance vision is usually 7 feet or further from your eyes like street signs and movie screens. The multifocal lenses allow for vision in this full range while a standard lens is usually more limited to single distance range.